Hate it when the drink in your hand gets dilute when you are in the middle of a conversation with your friend? 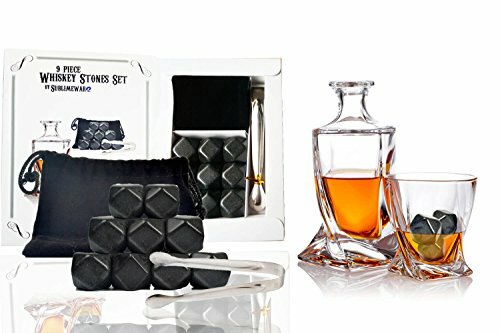 This 9 pcs Whiskey Stone set by SublimeWare would be perfect for such occasions. These whiskey stones are FDA approved and are safe to put into your drink. It is easy to wash and can keep your drink testing strong and chilled. Comes with one stainless steel tongs, this makes the perfect gift set for your love ones. So press "ADD TO CART" now! 100% satisfaction guaranteed, with 30 a day return policy not questions asked! [KEEP COOL WITHOUT DILUTING YOUR LIQUOR!] - Have your lastes sip taste the first! NEVER DILUTE your drinks again. Enjoy your Whiskey (American and Irish producers), Whisky (Canadian, Scottish, Japanese producers), Non Alcohol Drinks, Vodka, Wine, Scotch, Bourbon stones, Rum, Cocktails etc with worrying the ice will water down your drinks! [PERFECT FOR SOCIAL EVENTS AND GIFTS] - Great for social events! Everyone will be enjoying the party without complaining about the watered down drinks. Also makes for a great gift for your whiskey drink uncles and dads. Just perfect Father's Day and Christmas Gift! If you have any questions about this product by SublimeWare, contact us by completing and submitting the form below. If you are looking for a specif part number, please include it with your message.